Wearing | Chacos all. the. time. I'm so happy Spring is back and trying its hardest to stick around. I have to wear closed toe shoes to work, which is one of the saddest things when the weather is fantastic outside. So, the first thing I do when I get home is kick off the shoes and roam around barefoot! And whenever I go out, it's Chaco time! Sipping | Water, water, everywhere. I'm trying to get more water back into my routine. Although my favorite springtime and summer drink is lemonade, pink or regular. Wishlisting | Books. All the books. If you guys could just see my Amazon wishlist. Also, I still really want a FitBit. And I saw that Target has them, so I may really get my hands on one. Spring is the perfect time to revamp the health and fitness plans. Writing | I haven't done much writing in the past couple weeks. I do have some ideas roaming around that I'm hoping will eventually be written down. Some future posts will be some adventures I've gone on around the city, an apartment tour, more of the #SnapshotsOfMobile series, and some more posts on singleness! But, in the meantime, check out this post which has quickly become one of my favorites! Exploring | My city, Mobile! I have some fun posts coming up that will be filled with pictures of some adventures I've gone on around the city. I've explored and found some really cool places throughout the city. If you've been following along with my #SnapshotsOfMobile series or follow me on Instagram, you've probably seen a couple of highlights. But, I can't wait to share a full post of pictures with you all soon! I highly recommend getting out and being a tourist in your town, it's a ton of fun! I'm a fan of goals. Short term, long term, big and little. I will even write something on my to-do list that I've already done just to mark it off. Yes, I'm that person. There are things that I hope to do this year and I actually want to do them. Small, little, short term, long term. So, this year, I'll be joining in and posting my goals at the beginning of the month and then recapping the next month to see how well I followed through. Feel free to keep me accountable on these things! Read two books | Guys, at this point, I just want to be able to finish a book. Create a Facebook page for Polished Arrow | Yes! And if you haven't liked it yet, you can do that by clicking here. Join the Sunday Post Challenge | I'm way behind on this, but would love to still get some letters out before this challenge is over. Memorize at least one Scripture verse | Didn't happen. No excuses. Make time for prayer | Yes and no. I've been wanting to set aside a specific time of the day for prayer, but that didn't happen. I have journaled my prayers a bit more and made time to reflect on sermons from church. I also listen to podcasts in the morning on the way to work, which allows for more reflection and prayer. Memorize at least one Scripture | Exactly the same as last month. Having the Word on our heart as Christians is one of the most important things for growing in our walks. I have a bad habit of knowing Scripture, but not knowing where it is in the Bible. Or I can remember a reference, but not what it actually says. This year, I want to make it a priority to memorize the Word. Make time for prayer | I want to build on what I started last month in keeping with journaling my prayers and reflecting on sermons. This month I want to actually set aside a time daily for prayer. I like my sleep, so mornings isn't the best time for what I have in mind. I try and stick with a regular bedtime, but I do have my afternoons free. This is usually when I'm really focused and ready to get things done. So, when I get home from work in the afternoons and before I start my evening may be the time for my dedicated prayer and quiet time. Focus on health and nutrition | I stepped on the scale a couple of weeks ago and surprisingly saw that I had met my goal weight. Talk about the unexpected! Spring is a time for renewal and new life, so what better time than now to re-focus on my health goals. I have a new weight goal and want to focus on nutrition (and exercise). Nutrition is more fun for me, because I like to cook. Exercise, not so much. Real talk, y'all. Complete the puzzle scattered about on my kitchen table | Just a fun one. I mean, really. That puzzle doesn't need to be there much longer. I really need to work on getting that finished. Make Blessing Bags | I live in the city, so no doubt that I see the homeless on a daily basis. I've even begun recognizing faces. The man from the library. The one across from the fountain. The group near the bench. I've done ministry with the homeless before, but now I want to have something handy with my always. I want to make blessing bags - ziplocs filled with goodies and helpful items - to keep in my car for when I'm around town and come across someone in need. I'll keep a couple in my glove box and the rest in the trunk for easy access. for the rest of the month that I would love to start on. I imagine that one of the best parts of being engaged (and getting married) is having parties where you get lots of presents. I mean, who doesn't love presents? Birthdays, Christmas, graduations, baby showers, engagements, weddings. Presents show up at all of them. I attended a bridal shower once where the bride-to-be was given a surprise gift by all the hostesses. It was the holy grail of all wedding presents. A KitchenAid stand mixer. We all gasped and oooed and awwed, while flocking to the box to check it. The bride-to-be was so surprised at her new beautiful appliance. I'm sure she started thinking about all the things she would be baking in the future. I went over and grabbed the box, pretending I was going to snag it for myself. I mean, it's not just the holy grail of all wedding presents, but the holy grail of all kitchen appliances! Anyone who loves baking and creating in the kitchen wants a Kitchenaid mixer. I made a comment to the hostesses that I was now expecting a KitchenAid mixer. One of the ladies came back with, "You don't get a KitchenAid mixer until you get engaged." And I thought to myself, "who made up that rule?" Now, I know she was probably just joking and teasing with me when she made that statement, but it stuck with me and recently got me thinking. What else do I not get to do until I get engaged? I love cooking and baking. But, because I'm not married does that mean I can't cook every night if I want to? I love traveling. But, because I'm not married does that mean I can't travel to different places and have vacations in exotic places? I want my own house. But, because I'm not married does that mean that I can't one day buy my own house and have people over to enjoy the space? Because I'm not married does that mean that I can't go out to a dinner and a movie? Can I not buy myself a KitchenAid mixer? Of course not. My singleness does not limit me in these things. My singleness does not hinder me from living life. I just do it a little bit different. Of course friends may come along during any of the journeys, but traveling will be for one. Which makes it cheaper and frees up time for me to do what I want. If I own my own house one day, it will be decorated and cleaned how I want it. I can have people over whenever, seeing as there will be no inconvenience to another. I won't have to worry about someone talking during a movie. And I can cook all the foods and baked goods that I love for myself and decide later whether I want to share or not. Or, I can invite tons of people over to my house and have them sit around the kitchen table talking as we bake and eat. Which is one of my heart's true desires. Don't get me wrong, I can see the benefits and upsides of sharing life with someone as well. There would always be someone to bake for. Someone to remind you to get your stuff from the bathroom before you leave the hotel room. Always someone to turn to when you have a bad day. A person to enjoy sitting on the couch with. Yet, still no talking during the movie please. All I'm trying to convey is this: my singleness should not hinder me. My singleness will not hinder me. My singleness does not hinder me. I don't want to push aside or put off certain experiences just because I'm single or because I'm waiting for marriage. Because, (here's the tough pill to swallow) that season may never come for me. I don't want to keep waiting and miss out on all the other things the Lord has planned for me because I thought I couldn't do it until I got married. If marriage doesn't come for me, I don't want to look back 10 years from now and see the things that I missed out on. In 10 years, marriage or not, I want to look back and see that I did all I could. That I followed the Lord wherever He led. I want to see that I continued doing things that made me happy and allowed me to experience joy. Looking back, I want to see that I built friendships and maintained them. I want to see that I traveled and shared the Gospel. I want to see that I used all the Lord gave me to bless others. I want to see that I used those years of singleness for the glory of God. In 10, 15, 20 years, marriage or not, I want to look back and say that I didn't squander my young, single years. I want to say those were the years where I grew up. Those were the years that I freely allowed the Lord to use me. That was the season that my singleness didn't hinder me. This is the season that my singleness does not hinder me. I pray that I freely allow the Lord to use me, whenever and wherever He chooses. And, if during any point of this journey someone does get me a KitchenAid mixer, I would like mine to be in retro blue. If you are single, are there some things you have been wanting to do, but may have put off because of your singleness? If married, was there anything you wanted to do in your single years that you didn't but would encourage singles to try? 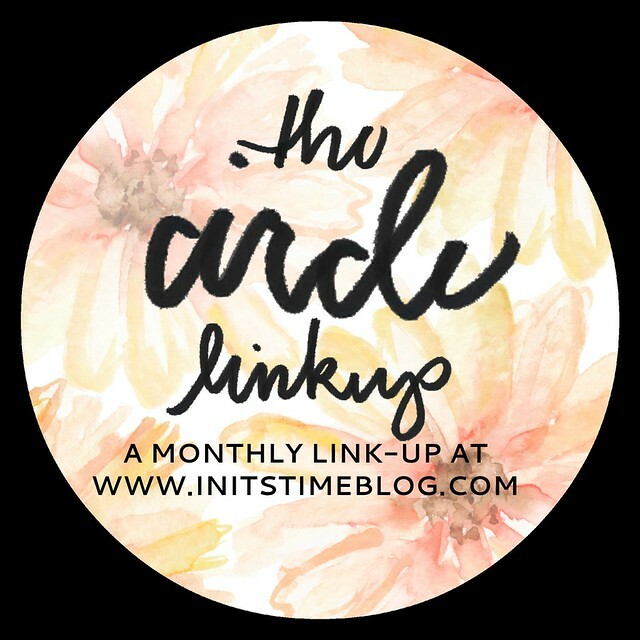 Linking up with Kiki and friends for one of my favorite monthly link-ups, The Circle. When I first started blogging, back before this space, I didn't have a very creative name. It was just...my name, Jess Elyse. Then, when I started this space, I knew I wanted something different. I wanted something creative, unique, and meaningful to me. Polished Arrow has quickly become one of my favorite spaces. I love the community that I have gained through this space. I love having conversations with you guys in the comments and through e-mail. I love the creativity that comes with blogging. Going back to the name, I wrote a post describing the meaning shortly after I started this space. Back when all the page views were probably my own (it's probably still that way). So, for this edition of The Circle, I'm pulling out a post from the archives. Also, it's kind of cool to see how my writing style has changed just from looking at this old post to more recent ones. Enjoy! Is there a special story behind your blog name? Have you changed your blog before? Are you wanting to change your blog name now? A few weeks ago, I tweeted about how one of the worst parts of winter for me is my dry skin. It's so bad. Between the frigid wind, cold temps, and constant hand washing at work, my skin is always dry and cracking in the winter time. I'll even try and remember to wear gloves, but that doesn't always happen. Well, one afternoon I got a tweet from Vaseline saying that they were interested in helping make winter more enjoyable for me. And I thought, why not?! Yesterday afternoon I got to pick up a package from Vaseline. This box quickly made Monday much better and I rushed home to open it. I really was only expecting some lotion, but got so much more! First, I opened it up to find a hand-written note. Then, I discovered the rest of the goodies within the bubble wrap! Can I just tell you how excited I am about that candle up there? I flipped out when I saw that it was Vanilla Bean. That is one of my favorite scents! I can't wait to start burning it. Now, I've tried a lot of different hand lotions and cremes to combat dry skin and I've tried to get in the routine of applying on a daily, routine basis. But, that doesn't always happen. Some cremes I've found to be too thick and some lotions not thick enough or too greasy. And then I can't pick up anything and well, that just isn't fun either. Vaseline was a brand that I've never thought to try. I've always assumed that it would be too greasy. And while I want my hands to be moisturized and soft, I don't want them to be wet. So, I was really interested to see how this would work out. The smell is fantastic and the lotion is so smooth. I was only going to apply to my hands at first, but then I just kept going and gave my arms some love. Didn't want them to feel left out. Remember, my main thing was I thought this stuff was going to be too greasy. I was wrong. You definitely don't need a lot, a little goes a ways, but it wasn't greasy like I was expecting. This intensive care line is supposed to have 10x the deep healing power over dryness. Although winter is almost gone and spring is around the corner, my skin is in definite need of some healing and restoration. Not only do my hands stay dry from constant washing at work, I suffer from keratosis pilaris. This is fairly common and causes rough, small acne-like patches around the body. It's more frustrating than anything, but my skin doesn't always feel the smoothest. While I don't expect this lotion to improve or rid my body of KP, I do think it will help keep my body moisturized and feeling hydrated. Definitely adding it to my daily skin routine. Do you use any Vaseline products? What are your favorites? You know how in Times Square they drop the ball at midnight? Well, in Mobile, they drop a MoonPie. That's right, a MoonPie. MoonPies are a popular item thrown out at Mardi Gras parades and in Mobile, it has become tradition to drop the MoonPie every New Years. If you look up the right side of the building in this picture, you will see the MoonPie where it waits to be dropped every year. Does your town or city do anything special for New Years? A little update and housekeeping to let you guys in on. I know there hasn't been much content going on around these parts for the past couple of months. I've honestly been struggling to come up with things to write or I'll think of certain things but remain unsure about whether to actually publish. It's hard being vulnerable on a space that is so public. But, one of the things I've always wanted to maintain on this blog is authenticity. Who I am away from this space is who I want to be in this space and vice versa. I'm happy to blog, I love the community it brings. And Ie love sharing photos, goals, and life with anyone who comes upon this space to read. But, I never want to stop being real. So, one of my goals for March? Keep it real with you guys. I think it will be great.